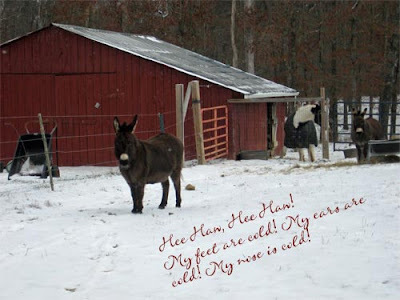 Here on the farm, we've been going through the same very cold and snowy, freezy weather that the rest of the South and Southeast has been going through. So, lots of time spent unfreezing pipes, and hauling buckets of water for the livestock. The weather is improving now, back to 40's in the daytime, which makes the animals and the people here really happy. I've been staying in, keeping warm, and working on new things for DigitalAntiques on Etsy. 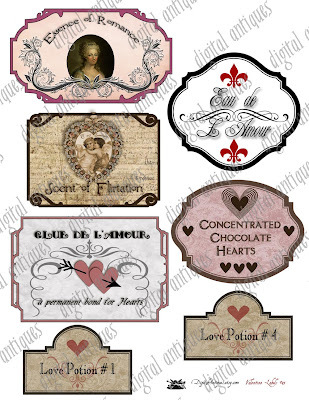 New Valentine Cupids, and a set of Valentine Labels. 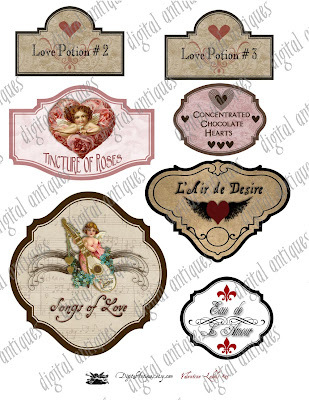 Think Love Potions, and some other fun labels for jars or boxes. Make a fun, decorative display, or use for Valentines or Tags. Valentiney wishes for you, from the Dog and me. Love your Valentine labels.......come visit me to see what I made with one! Hey my sweet Jan! I know I've left everyone hanging, I've just been feeling so bad. Queasiness and the computer just do not go together! Dr. says queasiness is a good sign, so I'm not complaining. Btw, we got SNOW on Friday. Almost 4". It was the most beautiful thing. I nearly cried when it melted. It makes everything pretty and you can walk in the dark and see! It was amazing! !